Mount Everest might be the be-all, end-all of mountaineering, but it's also a dumping ground for the climbers striving upon its face—which is littered, as National Geographic puts it, "with garbage leaking out of the glaciers and pyramids of human excrement befouling the high camps." This week, Nepal announced a new rule aimed at cleaning it up. Right now, climbers on Mt. Everest are, theoretically, required to bring back their own trash. But a combination of factors, including the challenge of enforcement and the sheer necessity of offloading weight in emergency situations, makes the rule little more than a suggestion. A host of new requirements introduced by the Nepalese tourism ministry this week are aiming to fix this decades-old problem. Think of it as a garbage tax. According to the new rules, each climber will be required to bring back 17.6 pounds of refuse—in addition to their own trash. When each person who goes up the mountain comes back down, they'll have to present their trash at a new government office that's being set up at Base Camp, where their haul will be weighed and certified. What happens if they're underweight? That's not entirely clear yet—Nepal's tourism ministry official says it will "take legal action against them." 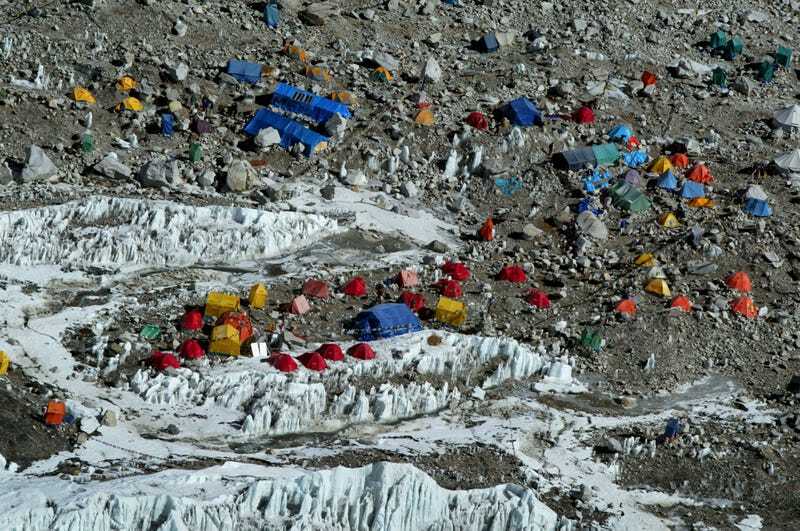 Everest's trash problem has been growing for half a century. The fact that littering is so interwoven with survival is part of the problem—if it's a choice between spending your last bit of energy to haul your empty oxygen tanks down the mountain and actually getting down safely, it's hard to argue with climbers who chose the latter. One cleanup group collected 13 tons of garbage over the past four years, but there's more than ten more tons still up there, the contents of which include everything from cans to broken gear to poop—not to mention hundreds of corpses of climbers who died on their treks. British mountaineer Michael Westmacott testing an oxygen breathing apparatus equipment to be used on an attempt on Everest in 1953. Photo by Keystone/Hulton Archive/Getty Images. If Nepal's new rule does work, it'll be interesting to see how it affects the culture surrounding the world's top mountaineers. Right now, the emphasis is on climbing the fastest or without the added cushion of bottled oxygen. But, in the future, the challenge might be about how little you're carrying. Lead image: Paula Bronstein/Getty Images.